Studio Manager Greg Vandermause has been at the arena a lot lately. And just when we started to really miss him, he returned with real progress on the next big thing for the hockey broadcast. 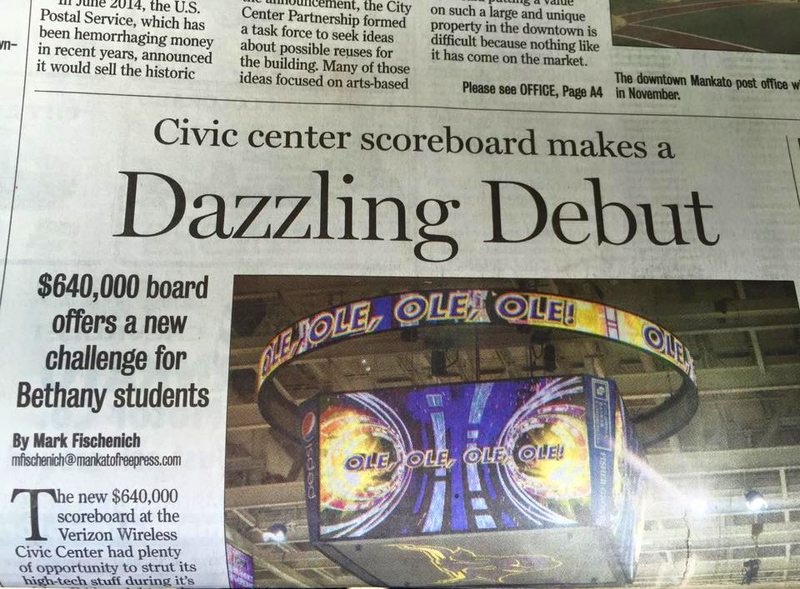 In short, the Verizon Wireless Center just installed a $640,000 scoreboard in the center of the arena. The Free Press released a great article on everything that went into this new and exciting feature, which will totally enhance the fan experience during Maverick Hockey games. Here’s a time lapse of the installation, courtesy of BLC Studios. The scoreboard is a dynamic addition to the arena, but it doesn’t run itself. That’s where we come in. 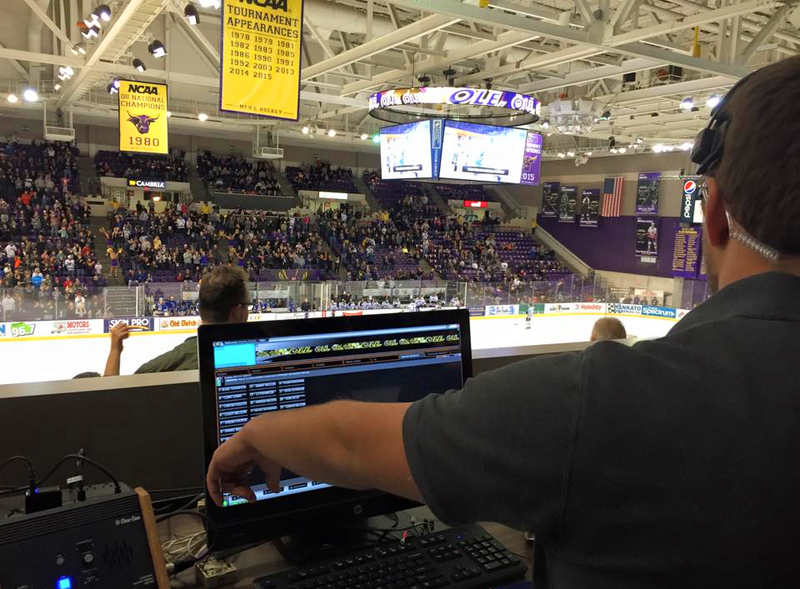 Greg has been working with the Verizon Wireless Center and Maverick Hockey staff on the particulars of both generating animations for the board and operating the board during the games. Right now, the graphics on the board came from Daktronic templates (Daktronic is the company that produced the board). These templates provide a workable solution to the content problem in the early stages, but our students are now beginning the process of putting together supplementary content, much of which will be customized with local sponsor logos. This project is a great opportunity for junior/senior motion graphics students who are interested in getting some real-world experience with both Cinema4D and Adobe After Effects. There’s a great demand for motion graphics artists right now in the entertainment marketing industry, which includes sports broadcasting, and we have 2 students starting to sink their teeth into the project. The initial debut of the scoreboard went very well—the fan response was strong and the operations ran smoothly. Stay tuned for more on the upcoming Bethany-generated graphics package! Bethany alumnus Anthony Miller operates the new scoreboard during last week’s games.